For a more thoroughly researched essay on Maiden Lane, please check out Maiden Lane and the Pot-holes of History by Peter Field, also in our archive. If you get tired of the posh respectability of Union Square, and find yourself with a hankering for sin, sleaze, and assorted sordid stuff, where can you go? In the words of the immortal Horace Greeley, "Go west, young man." West along O'Farrell Street, that is. You'll traverse the Tenderloin District, San Francisco's scummiest neighborhood, a filth-encrusted hotbed of immorality, indecency, lewdness, corruption, and all manner of vice. (The Tenderloin got its name from the custom of paying higher salaries to police that worked in this crime-ridden area, thereby enabling them to buy choicer cuts of meat.) Eventually, if you haven't been mugged, robbed, raped, shot, or convinced to cough up a few dollars for the purpose of either acquiring some dubious mind-altering substance and/or participating in a brief, mutually-degrading physical encounter on a sagging bed in a roach-infested unfurnished room, you will reach the Mitchell Brothers' O'Farrell Theater, where your thirst for sleaze (and grotesquely overpriced drinks) can be slaked. Actually, O'Farrell isn't really San Francisco's sleaziest street; it has to compete with cross-streets Taylor, Jones, Leavenworth, Hyde, Larkin, and the inimitable Polk, where runaway children of both sexes may be bought and sold; and with parallel thoroughfares Ellis, Eddy, Turk, and Golden Gate. Every night, and especially every Saturday night, this dismal bedlam of obscenity, lighted only by the red lamps above the doors of the cribs, was thronged by a tumultuous mob of half-drunken men, who stumbled from crib to crib, greedily inspecting the women as if they had been so many wild animals in cages. From the casement-windows leaned the harlots, naked to the waist, adding their shrill cries of invitation to the uproar, while their pimps haggled with passing men and tried to drag them inside the dens. If business was dull, the pimps sold the privilege of touching the breasts of the prostitutes at the standard rate of ten cents each or two for fifteen cents. 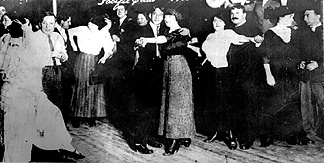 But on Saturday nights some of the more popular women, who had built up a more or less regular clientele, remained in their workshops from dusk to dawn, while the pimps kept the men standing in line outside, their hats in one hand and money in the other. It was not uncommon for a Morton Street prostitute to entertain as many as eighty to a hundred men in one night." San Franciscans believed that redheads, especially Jewish redheads, were sizzling hot. A madam named Iodoform Kate made a fortune during the 1890's by offering at least one red-haired Jewess in every crib. 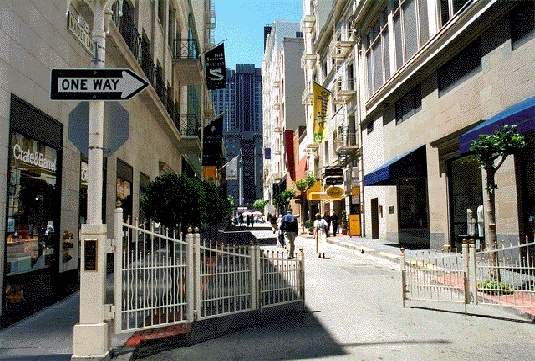 The two blocks of Maiden Lane look perfectly respectable now. There's even a Frank Lloyd Wright building, the Circle Gallery, at 140 Maiden Lane. What happened? The earthquake and fire of 1906, that's what. After more than forty years of pandering to San Franciscans' lewdest and most degenerate tastes, the cribs burned in the great fire and were never rebuilt; by then, property values in the area had skyrocketed, and the land was taken over by legitimate business. But don't worry, you can still find plenty of sleaze just a short walk from Union Square.